Riding the highest train in the world! The Lhasa to Chengdu train takes a mere 48 hours and runs across the Tanggula Pass, which, at 5,072 m (16,640 feet) above sea level, makes it the highest in the world. 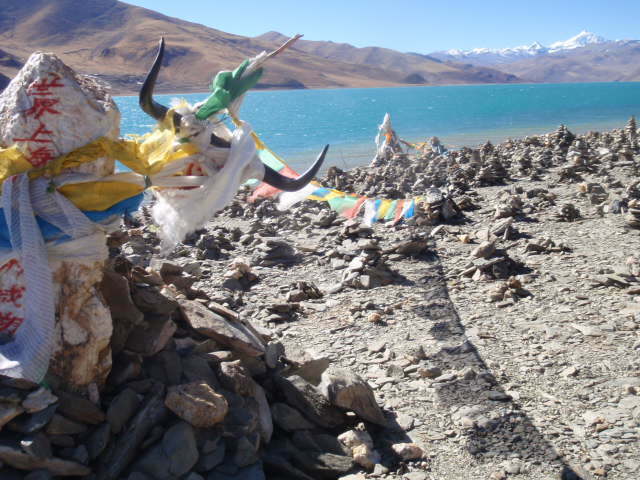 Lhasa, however sits at a pithy 3,490m. Now, we’d walked around a bit at this altitude – but we hadn’t really done anything strenuous. Not that cycling 6km to the station is strenuous, surely?! The persistent cold had started to take its toll and the night before departure Liz had raging flu through the night. With Liz sweating like a spit roast and the niggling bike-on-train concerns nipping at our ankles we woke and set off early. After about 10 mins of cycling Liz started to lag behind, her pace slowing to a wobbly crawl which soon whimpered to a stop as she clambered off her bike and slumped on the sidewalk. Her breathing was shallow and light and she was fazing in and out. We had to make the train! If we missed it, it might be days before we could get on another! But with Liz’s lungs, legs, and will power folding panic/hysteria set in. And the great thing about panic/hysteria is that it is highly motivational. After a brief rest, and much cajoling, bracing, and rallying we set off again, one little wheel at a time, for every turn of the pedals we coasted for a while, slow but do-able. Slowly slowly we teetered our way to Lhasa station. Once through the security x-ray we hit our first ‘no’. ‘No bikes, not possible’ a smiley security lady informed us – ‘whatever’ a grey Liz grimaced back as we pressed on through into the compound. We found the holding area for our train; ‘No, No bikes’ the brusque ticket inspector snapped and shooed us back out the door… ‘here we go’ we thought. Eventually a random security guard directed us to the China Railway Express Delivery office. So in we marched (Liz was exuding the pink glow of ill health that was making her look wonderfully unhinged) to a sea of baffled faces. ‘No, no bikes. Fly. You will have to fly’. The fat-controller decreed before waddling off into his office. The angel came along with 2 more western cyclists also hoping to get on the train to Chengdu. They had said angel/guide with them. An angel/guide who spoke Chinese and English (hoorah!). Suddenly the absolutely-no-ways and you’ll-have-to-fly’s turned into – ‘bikes on trains? To Chengdu? Sure! They’ll be there in 3 days, just fill out this form and pay us some money’… It took about 10 mins to sort the paperwork and we (and our bikes) were on our way to mainland China…. we hoped! The Chinese eat pot-noodles. They eat LOTS of pot-noodles – thank goodness, then, for the little hot water dispensers available everywhere. Without them instant noodles could not be consumed at such a pace! Hoorah for hot water dispensers! They also served us well on our 48 hour epic train journey… we had a limitless supply of free hot water to drink! .. what a shame we didn’t think of bringing hot chocolate or, indeed, pot-noodles! *sigh* Good thing the buffet car did corking, fresh cooked (ish) meals, shame it was rammed full of smokers / smoke. No open windows in this weather and at this altitude. Joy. A dull (though wonderfully warm) 48 hours later we arrived in Chengdu. Where upon we found out that we couldn’t extend our group visa. Super. 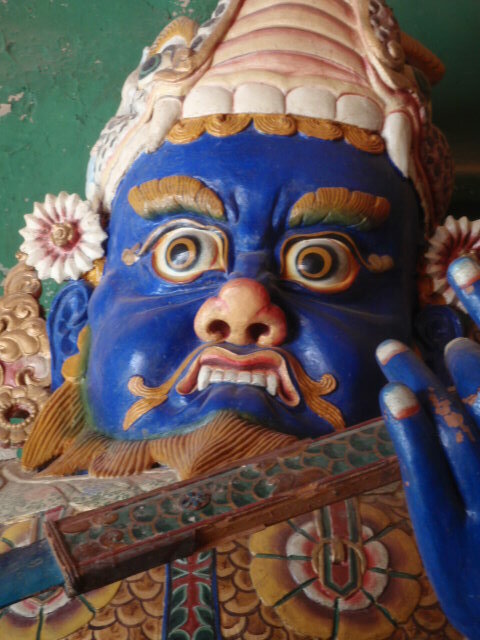 Good to know that our simpering Kathmandu travel agent had stood up to our low expectations. .. and to top it all off our laptop broke – stamps of ‘lifeless’ and ‘doornails’ were clumped upon it by a day’s worth of Chinese techie geeks, so we brought a new one, and then to top that all off it started working again *sigh* but at least it was hot and sunny again, so we sent our winter coats home, and then to throw a cherry on them bananas it started to snow…. great. Roll on Vietnam.